Full-depth precast concrete deck systems have several advantages over cast-in-place (CIP) concrete decks in bridge construction, such as improved construction quality, reduced construction time and impact on traveling public, possible weight reduction, and lower life-cycle cost. 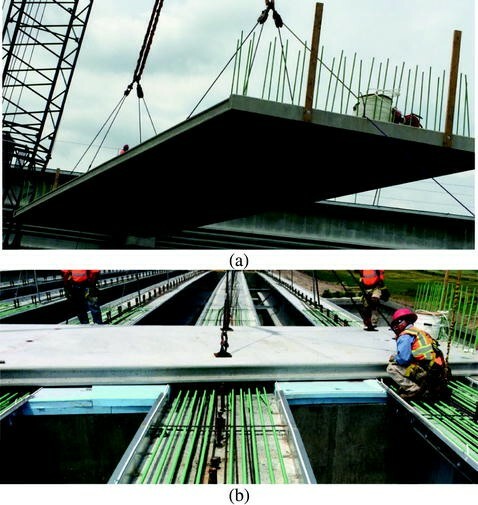 This paper presents the development of a new full-depth precast concrete deck system for accelerated bridge construction. The new system overcomes the drawbacks of existing systems, such as the large number of panels, joints, and openings; complexity of panel production and erection; need for an overlay; and difficulty of post-tensioning and grouting operations. The developed deck system consists of full-width precast concrete deck panels that are 12 ft (3.6 m) long to minimize the number of panels and joints. Panels have covered pockets at 4 ft (1.2 m) spacing in each girder line for shear connectors. These pockets were designed to minimize deck surface penetrations and eliminates the need for a deck overlay. Deck panels are prestressed in both directions: pre-tensioned in the transverse direction and post-tensioned in the longitudinal direction using a new approach that eliminates duct installation and grouting operations. These unique features enhance deck durability and improve its economic competitive with CIP concrete decks. The paper also presents the construction sequence and a case study for the implementation of the new system. Precast concrete deck systems have several advantages over cast-in-place (CIP) concrete decks commonly used in highway bridge construction. Examples are improved quality and safety, reduced construction duration, and minimized maintenance cost. The quality of precast concrete decks is superior to CIP concrete decks as production occurs in a controlled environment eliminating the variability in environmental conditions, casting crews, and curing procedures. Moreover, shrinkage cracking in bridge decks is minimized in precast systems due to the relatively small panel size, two-way prestressing, and delayed composite action with supporting girders. Composite full-depth precast concrete deck systems are commonly used because of their structural efficiency and reduced overall depth and cost of the superstructure. 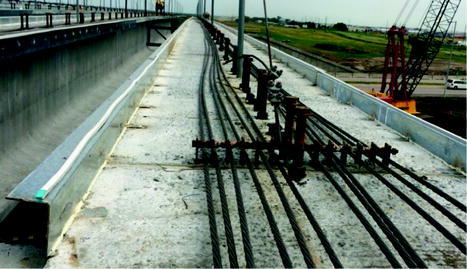 Existing full-depth full-width composite deck systems use either continuous open channel along each girder line (trough) or closely spaced discrete openings (pockets) to accommodate the shear connectors of the supporting girders. The troughs or pockets are then field grouted and the deck surface need to be protected by an overlay similar to CIP concrete decks, which increases construction duration and cost. In addition, transverse joints between adjacent deck panels are either conventionally reinforced or longitudinally post-tensioned using embedded ducts. These transverse joints and/or ducts have also to be field grouted, which complicate panel fabrication and erection processes and, consequently, reduce the attractiveness of precast concrete deck systems as an accelerated, economical, and durable alternative to CIP concrete decks. 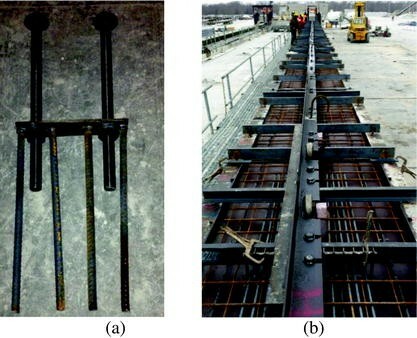 Simplify the fabrication of the supporting girders by using discrete clustered shear connectors at 4 ft (1.2 m) spacing (the largest spacing allowed by AASHTO LRFD (2014)). Fabricate the largest possible full-depth full-width precast concrete deck panel (12 ft (3.6 m) long) to minimize the number of panels and joints that need to be field cast. Also, no reinforcing bars and/or ducts are projecting out of the panel to void any potential corrosion during the service life. Use covered shear pockets in the panel with minimal penetrations to eliminate the need for deck overlay. Lifting inserts can be located at the shear pockets. Prestress the panel in both directions: transversely using pre-tensioning and longitudinally using post-tensioning to control cracking and increase the service life of the deck. Position post-tensioning strands underneath the deck soffit and above the girder top flange (i.e. haunch area) to eliminate the need for placing post-tensioning ducts inside the panels, threading strands through embedded ducts and across the joints, and grouting the ducts after post-tensioning, which are tedious and laborious operations. 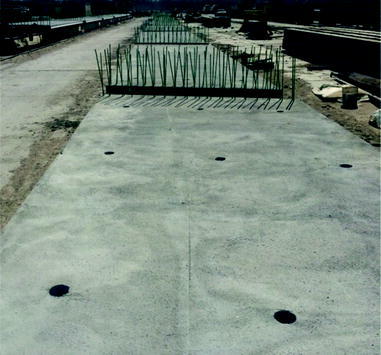 The new precast concrete deck system was recently developed jointly by Nebraska Department of Roads (NDOR) and University of Nebraska-Lincoln (UNL). 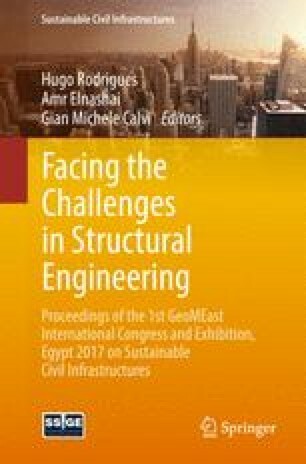 Several analytical and experimental investigations were conducted at UNL to evaluate the structural performance and constructability of the new system. For more information about these investigations, refer to Morcous, et al. (2013) and Morcous, et al. (2015). Also, the new system was implemented to the construction of the Kearney East Bypass project located in Kearney, NE in the summer of 2015. The next section presents the construction sequence of the new deck system. The following sections present the implementation project. Fabricate precast/prestressed concrete I-girders with shear connectors at 4 ft (1.2 m) spacing. Fabricate full-depth full-width precast/prestressed concrete deck panels with covered shear pockets and 4 in. diameter (100 mm) grouting holes, which will also host the lifting inserts. Erect all girders and check their alignment using a digital template to ensure that shear connectors in all girders match the shear pockets in deck panels within the specified tolerance. Form, reinforce, and pour end and intermediate diaphragms up to the girder top flange. Conduct shim shots on the edges and center of each girder line to determine the actual profile of the cambered girders prior to panel erection. Attach the deck support system made of bent plates by welding them to the girder top flange to achieve the desired deck elevation and a minimum haunch thickness of 3 in. (75 mm). Attach extruded polystyrene panels to the diaphragm concrete between girders to fill the gap between the deck panels and diaphragm concrete between girders. Adjust the height of shear connectors (by cranking or cutting) to achieve the specified embedment in the deck shear pockets (usually 5 in. (125 mm)). Attach compressible material to the top of the deck support system to fill any gaps between the deck soffit and the deck support system. Lay down post-tensioning strands longitudinally on top of each girder and thread them through the end deviators embedded at the ends of each girder line. Lay down negative reinforcement bars on the top flange of each girder over the intermediate support. Bars should be staggered and supported using chairs to avoid conflict with strands. Erect each deck panel using the specified lifting points and place it on the deck support system. Use backer rod to fill the gaps between adjacent deck panels and clean/moist the joint surfaces. Pour flowable concrete/grout in the transverse joints between deck panels. Raise post-tensioning strands at the ends of each girder line to the mid-height of the deck and thread them through the holes of the anchor plates. Tension individual post-tensioning strands using mono-strand jack starting from the middle and moving symmetrically outward. Repeat this process for each girder line starting from the middle one and moving symmetrically outward. Pour flowable concrete/grout to fill the gap between the deck soffit and girder top flange as well as shear pockets using the provided holes. Pouring should continue until the concrete overflow from every hole. Form, reinforce, and pour approach slabs and the area around post-tensioning blocks. Form, reinforce and pour the rails. Grind the top surface of the finished deck up ½ in. (12 mm) to ensure a leveled ridding surface. The Kearney East Bypass project is located in Kearney, NE over the US-30 and Union Pacific rail road tracks. The project consists of twin two-span bridges: a south bound bridge with cast-in-place concrete deck; and north bound bridge with precast concrete deck. Construction of the superstructure (girders, deck, and rail) of the two bridges was done concurrently starting in May 2015 and was completed in September of 2015. Each span is 166 ft (50 m) long and consists of five NU1800 precast/prestressed concrete I-girders 71 in. (1.8 m) deep with 8 ft 6 in. (2.6 m) spacing. Bridge width is 41 ft 8 in. (12.6 m) and has a 14o skew. Both cast-in-place and precast concrete decks are 8 in. (200 mm) thick and have closed cast-in-place concrete rail. The following sections summarize the fabrication of precast concrete girders and deck panels of the north bound bridge conducted by Coreslab Structures Inc. at the Plattmouth, NE plant, and their erection conducted by Hawkins Construction, Inc. The only two differences in the production of the bridge girders between the CIP and precast concrete deck systems are: (1) shear connectors; and (2) post-tensioning strand deviators. Shear connectors for the precast concrete deck system consisted of two 1.25 in. (32 mm) diameter A193 Grade B7 coil rods spaced at 4 ft (1.2 m) along the girder. Each connector was made in an assembly of two rods, four nuts and washers, one plate, and 4 #6 (No. 19) bars as shown in Fig. 2a. Connectors are placed in the girder web and attached to pre-slotted steel angles, shown in Fig. 2b, to hold them and ensure that spacing is within the specified tolerance. The portion of each rod embedded in the girder was greased to allow cranking it up later to adjust the height as needed. Post-tensioning strand deviators are similar in concept to the hold-down devices used in depressing pre-tensioning strands. They are placed at the abutment end of each girder to depress deck post-tensioning strands from their end location (i.e. middle of the deck thickness) to be under the deck soffit (i.e. haunch area). Figure 3 shows the custom-made post-tensioning strand deviators for 12-0.6 in. (15.3 mm) diameter post-tensioning strands. The 12 ft (3.6 m) long, 41 ft 8 in. (12.6 m) wide, and 8 in. (200 mm) thick precast concrete deck panels were produced using the same prestressing bed used for precast concrete sandwich wall panel production. A total of 26 typical panels were produced at a rate of four panels at a time, in additional to two special end panels that have anchorage blocks. Each panel has a total of 15 pockets (3 pockets for each girder line) for shear connectors. Each pocket consists of HSS 16 × 8 × ¼ (400 × 200 × 6) with 4 #5 (No. 16) bars welded to each side as shown in Fig. 4a. Custom-made lifting inserts were added to some of the pockets to be used in panel handling and eliminate the need for additional penetrations to the panel surface. All pockets were galvanized and positioned precisely by gluing wooded sheets to the bed as shown in Fig. 4b. All panels have 14o shew angle and were pre-tensioning transversely using 6-0.6 in. 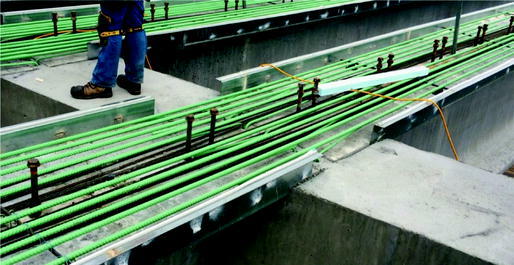 (15.3 mm) diameter strands at the level of the top reinforcement and 6-0.5 in. (12.5 mm) diameter strands at the level of bottom reinforcement. Styrofoam was used to form the 4 in. (100 mm) diameter grouting holes and anchorage blocks, while plywood was used to form the shear keys along the panel edges. Figures 5a and b show the forming and reinforcement of a typical panel and end panel respectively. All panels were made using the conventional bridge deck concrete mix but with a specified 28-day compressive strength of 6,000 psi (41 MPa) and release strength of 3,500 psi (24 MPa). Figure 6 shows the completed panels. Girders were shipped and erected similar to conventional bridge construction. Slightly more attention was given to positioning girders in their exact locations. After placing end and intermediate diaphragms, galvanized steel bent plates were welded to the metal tabs embedded in the girder top flange according to girder profile data obtained from shim shots and specified deck profile and haunch thickness. This deck support system also works as side forms for grouting the haunch area later. Therefore, a compressible sealing strip was attached to the top of the bent plates and caulking was used at the bottom of the bent plates, as shown in Fig. 7, to prevent grout leakage. Figure 7 also shows the 12-0.6 in. diameter post-tensioning strands laid over the top flange for each girder line and through the end deviators. Figure 8 shows the 10 #8 (No. 25) Grade 60 (420 MPa) bars installed over the girder top flange (i.e. in the haunch area) over the intermediate pier to provide live load continuity and resist negative moment. Figure 8 also shows the greased rods of the shear connectors cranked up to the calculated elevation that achieves the specified embedment of each rod into the shear pocket. Panel erection was done using a single crane and the 8 lifting inserts embedded in the pockets as shown in Fig. 9a. The installation of the first panel occurred at the pier location as shown in Fig. 9b and remaining panels were then installed in both directions until end panels were installed at the abutment locations. Installation duration was approximately 30 min for the first panel and 20 min for each panel thereafter. Deck support system and post-tensioning strands. Live load continuity reinforcement over intermediate support. Erection of precast concrete deck panels. 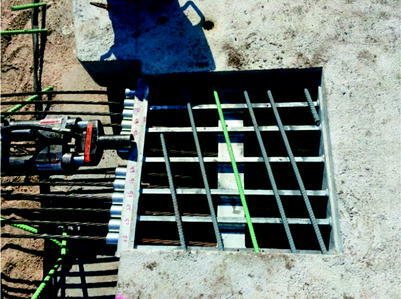 Figure 10 shows one of the transverse joints between deck panels and the placing of conventionally vibrated concrete at the joint using a bucket and shovel. The concrete mix was the same one used in panel production. Transverse joints were covered immediately with curing compound then later with wet burlap. Once the joint concrete achieved the specified compressive strength, post-tensioning was conducted using a mono-strand jack from one end as shown in Fig. 11 to apply 500 psi (3.5 MPa) stress across the deck section. All the 60 strands were tensioned in a symmetrically alternating manner to minimize eccentricity effects on the deck. Measured elongations of all strands were with ±5% of the predicted elongation. Placing concrete for transverse joints. Post-tensioning strands and anchor block. The grouting of the haunch, shear pockets, and anchor blocks were conducting using highly flowable and high strength self-consolidating concrete (SCC). The mix had a nominal maximum size of 3/8 in. (10 mm) limestone aggregate, specified strength of 8,000 psi (55 MPa), and slump flow of 28 in. (700 mm) as shown in Fig. 12a. SCC was pumped from one location (at the bridge pier) to the 4 in. (100 mm) diameter grouting holes on the deck surface using the apparatus shown in Fig. 12b (hopper, bucket, and inverted cone). SCC was placed from one grouting hole and flowed in both directions until overflowed from the adjacent holes, which were covered with sand-filled buckets before moving to the next grouting hole. This process ensured complete filling of haunch and pockets and took 1 h per girder. Figure 13a shows the deck surface after grouting and curing of SCC, while Fig. 13b shows the final deck surface after placing the rail and grinding the deck surface up to ½ in. (13 mm). The grinding operation tool 1 day, which is similar to the texturing operation done on the cast-in-place deck. The final deck surface will not have an overlay and will be monitored for any signs of deterioration in the next few years. It should be noted that few transverse cracks were observed at the transverse joints before deck post-tensioning. These cracks were closed after post-tensioning was applied and the final deck surface does not have any cracking. Also, there is no clear discoloration in the final deck surface between precast concrete and CIP concrete used in grouting the transverse joints and shear pockets. The research project was sponsored by Nebraska Department of Roads (NDOR). The contributions of NDOR engineers and staff under leadership of Mark Traynowicz are highly appreciated. Thanks to Todd Culp, Andy Flanagan, and Lance Overland from Coreslab Structures, Inc.; Jim Gregory and Jessie Ridder from Hawkins Construction, Inc.; and Afshin Hatami, Micheal Asaad and Raed Tawadrous from UNL.